This coastal sub-region covers the Burdekin-Haughton lowlands and includes the irrigated Burdekin agricultural areas around Ayr and Home Hill. It is bounded to the north-west by Mt Elliot National Park and to the west by the Leichhardt Range, where coastal plains give way to hilly country characterised by pastoral land use. 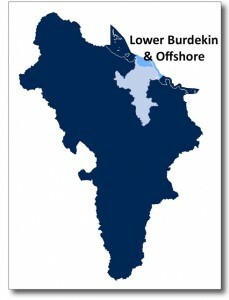 The sub-region includes coastline from the internationally-listed Ramsar wetlands at Bowling Green Bay in the north to Gumlu in the south-east. The coastal waters include seagrass-dominated, shallow marine environments of the GBR Lagoon which provide significant habitat for many iconic marine species and are covered by Bowling Green Bay and Upstart Bay Fish Habitat Areas and Dugong Protection Areas. The Burdekin River is the fourth largest river by flow in Australia and flows through this sub-region to its mouth near Ayr. This river generates the single largest suspended sediment and nutrient load point in the whole GBR Lagoon (NQ Dry Tropics, 2016). Key local assets are river water supplies, particularly from the Burdekin River, groundwater, flat irrigable land on alluvial soils, a picturesque natural coastline and extremely diverse and productive natural ecosystems. The coastal systems in this sub-region play an important role in providing ecosystem services to the surrounding community as well as flow on services to the adjacent GBR. The water from the Haughton and Burdekin Rivers is also used as an urban water supply and drought reserve for Townsville through an inter-valley transfer pipeline to the Ross River Dam. Approximately 18,000 residents live in this sub-region, mostly within Ayr and Home Hill and surrounding intensive irrigation areas. Away from the coast, larger grazing properties support a sparse population. The Lower Burdekin contains the largest irrigation area on the east coast of Australia. It is increasingly known as one of the most productive agricultural districts in Australia due to its abundant year-round supply of water supplied by the Burdekin Falls Dam higher in the Burdekin catchment. Combined with an average of 300 days of sunshine each year, it is consistently the most productive sugarcane growing area in Australia. The sub-region also produces fruit, vegetables, beef and seafood for domestic and international markets. This area is somewhat uniquely positioned to accommodate expansion, diversification and value-adding opportunities, however this relies on the ability to secure and transport water (including potentially raising the Burdekin Falls Dam), soil capacity and interaction of irrigation water with groundwater systems. In addition it would need to be within the constraints of downstream impacts on high priority wetlands and the GBR.